Potatoes last for a long time, and most people use them long before they might need to freeze them. 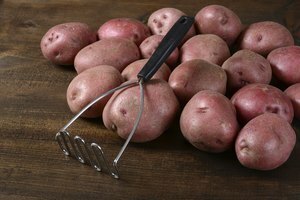 However, people who happen upon a major sale or farmers with an especially bountiful harvest may end up with more red potatoes than they could eat before the tubers went bad. Fortunately, you can freeze potatoes for the long term if you slightly cook them prior to storage. 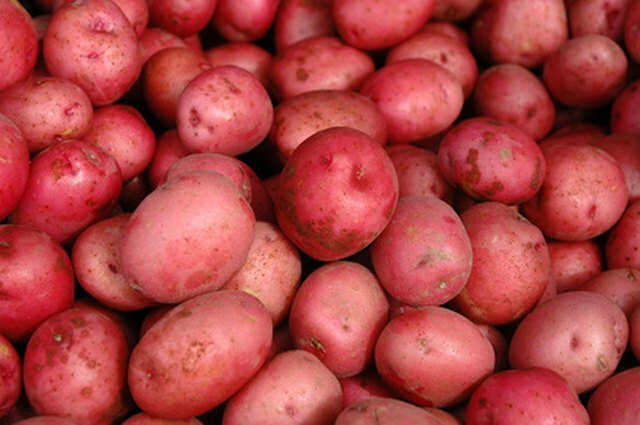 However, freezing red potatoes means you have to peel off their delicious, distinctive outer skin. Screen your potatoes for any discolored, bruised, decayed, wrinkled or sprouting specimens. 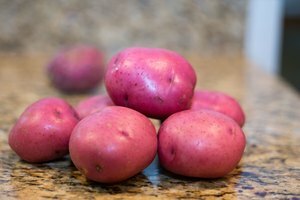 Freeze red potatoes that appear in near-ideal condition. Peel the red skin off the potatoes. Dice or cut the potatoes into strips as desired, or leave them whole. 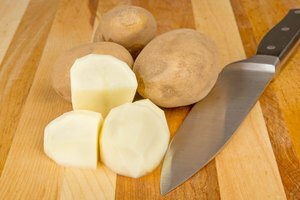 Separate small and medium-sized potatoes from larger specimens if you're not dicing them. Place all the potatoes of one size into a blanching basket. Bring a pot of water to a boil. Use 1 gallon of water for every 1 lbs. of red potato. Lower the blanching basket full of peeled potatoes into the boiling water and cover the basket with its lid. Allow the water to return to a boil, which should take about one minute if you're using the correct amount of water for the potato weight. Begin timing the blanching once the water returns to a boil. Cook diced, small or medium red potatoes for three minutes, and larger whole potatoes for up to five minutes. Lift the blanching basket out of the water, and allow the water to drain. Sit the basket aside and let the potatoes cool. Add the cooled potatoes to a moisture-proof freezer container, such as a plastic freezer bag. Remove all air from the container before sealing it. Label the container with the date and contents of the bag, then place it in a cold corner of the freezer with at least 1 inch of open space around it. Grated or french-fried potatoes can be cooked in oil rather than blanched.